Item No. 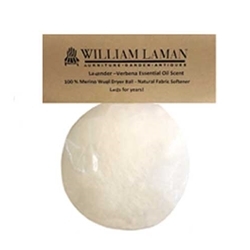 699 All Natural Wool Dryer Ball infused with Lavender and Lemon Verbena. It smells great, reduces drying time, wrinkles and static cling. Eliminate the use of chemical dryer sheets. Save money and save the environment. This cute, cuddly dryer ball will last for years and is the perfect hostess gift.